Before winter is even at the halfway mark, people are already dreaming of the summer sun and fun. Besides sloshing and trudging, not to mention driving, through ice and snow, there is the perpetual feeling of being shivery nearly half the year, a fact that is especially annoying when you are at home! And, not to be a malcontent, but, though you swore you wouldn’t complain about the heat, you know you uttered a few choice words when the mercury soared over 100 degrees. Your chilly home, as well as your high energy provider bill, could give you goose bumps and leave you in the poorhouse. You can’t fight Mother Nature, but you can ease the burden of that high energy bill and make your house more temperate year round, by choosing the right exterior window shades for your home. Below are the three most-popular options of exterior window treatments. You can peruse these styles on the internet, or visit a contractor or showroom which specializes in custom window treatments in New York City. One option for year-round comfort and protection from the elements is rolling shutters. Rolling shutters have been around for over a century but for years were more commonplace in Europe. They have been slower to catch on here as to residential use, but have been used in the past more often for commercial buildings. Not only do these heavy metal blinds protect the homeowner’s windows from sun, cold, storms and hail, but they also afford complete privacy, and, when rolled down, offer 100% security and protection from unwanted entry to the home through the windows. The only way to control the rolling shutters is from the comfort of inside your home and each window’s shutters are operated separately. They are permanently installed and left on year-round. Depending on the manufacturer, the vertical rolling shutters are either raised or lowered by a manual crank or electric switch found inside either a small box mounted adjacent to each window or installed in the ceiling. These are superb for people who need total darkness to sleep, especially if they are shift workers, and, an added bonus is they are heavy enough to block out noise as well. Retractable awnings have come a long way since your parent’s heavy, striped canvas awnings hung over each window back in the day. 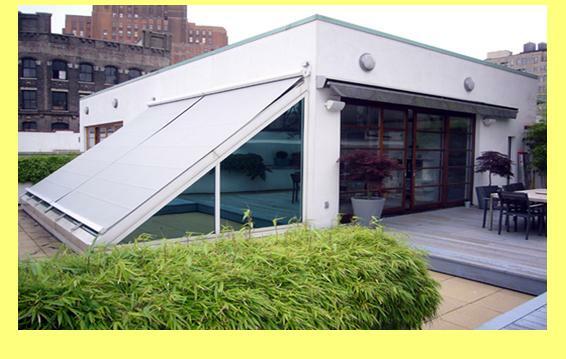 The more-modern retractable awnings come in every color imaginable and will fit any size or length of your home. They might line a side of your house, or just a front picture window. Retractable awnings are now usually operated by remote control, so gone are the tiring manipulations to open and close the awnings to follow the sun’s path. They are a Godsend in the summer months, but really do nothing to block much sun or protect against the cold during the winter months, however, as they are always closed in a cold-weather state. But despite retractable awning’s virtues and continued popularity, the trending way to control the sun’s rays is the use of solar shades. While the rolling shutters are a perfect way to tame the elements and provide added security to your home, some people may feel they are somewhat claustrophobic and prefer a lighter or airier exterior window protection. And, as discussed above, retractable awnings are really better for the summer months only. In a warm-weather state, people choose sun barriers on their windows to cool down the rooms so there is not a constant drain on the air conditioner to keep the house cool for many months out of the year. In addition, the constant sun pouring into the windows will fade furniture, floor coverings and window treatments. Though New Yorkers may embrace the sunshine coming through the window on a brutally cold winter day, during the summer months, the sun is not always as welcome. So, any means of filtering the sun is a plus to save energy costs and keep the home cool and comfy. Solar shades provide an excellent means of holding the harmful sun’s rays at bay. These vinyl shades stop 90 percent of the sun’s rays before they hit the glass window and substantially heat up your home. Solar shades provide excellent ventilation while protecting the sun’s harmful UV rays on your furnishings as well as yourself. Another plus is that solar shades are made of PVC-coated fiberglass materials which means that you can see out, but others cannot see in (although when the interior of the home is lit up at night, you may prefer an additional window treatment for added privacy). Once installed, solar shades are permanent. They come in vertical, four to twelve-foot widths and may be solar powered, motorized or manually operated. Like rolling shutters, they take up no interior room, save for the controls. Solar shades are no maintenance and once installed, just as easy as the push of a button, and almost like magic, the solar shades spring into action, slowly ascending or descending on their tracks until the entire window(s) are covered with an opaque shade. In their down position, once the sun has moved on, or morning has broken, simply by pushing a button, the solar shades will rise and disappear giving you a renewed view from your windows just in the blink of an eye. It couldn’t be easier and the energy savings in a very short time will help to pay for the cost of either of these exterior window treatments. Why wait any longer? Consult with a contractor who specializes in customized window treatments today to see what exterior window options might work for you.